We caught up with the man who makes many of the fabulous music systems that you groove to. 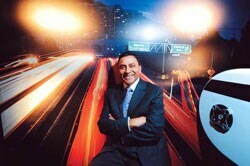 Dinesh Paliwal heads one of the world’s largest music equipment companies—Harman International. And he has quite a brand portfolio—AKG, Harman-Kardon, Crown, Mark Levinson, JBL, Soundcraft Studer, Lexicon, Infinity and DBX. But how did Paliwal, a self-described seller of heavy industrial machinery end up running one of the world’s largest audio companies and what are they planning? M: So, do you have a good ear? DS: No. Actually, my wife and kids are heavily into music but I’m being trained by some of the best in the business. I think my ears are improving. M: What brings you to India? DS: Well, it is where I’m from, but I’m here specifically to launch our new range of in-car entertainment systems. We have always been known for our high-end systems that are standard equipment in Mercedes, BMW, Lexus, among others. Our new range is aimed at making great in-car sound more affordable for more people—so we’ll be looking at middle-rung cars. Great sound makes driving so much more enjoyable and people want more from their systems—video, navigation, satellite radio, so systems are more complex and engineering such systems is where we excel. M: Are car systems big business? DS: Very big, car systems actually contribute 70 per cent of our revenues. M: Consumer products are not the mainstay of your business, all those cool JBL iPod docks, Harmon-Kardon home systems? DS: Well, of the remaining 30 per cent of our business, two-thirds comes from professional systems. Crown and JBL speakers, sound-systems, everything. We did the sound system at several venues, including the main stadium for the Beijing Olympics, and we are also doing the sound for the Commonwealth Games. But these systems also include audio in hotels and in some luxury apartments where Mark Levinson systems are used. M: So, those consumer systems aren’t that big? DS: They are, actually. But they are mainly for building our brand-image, which is why car-makers want our stuff. And still, I have to admit, our product lines do give home consumers quite a lot of choice as well. M: Are you planning any signature stores in India? DS: We work with our distributors to set up stores and we hope to have some top-end “sound studios” up and running in India pretty soon. We already have a few “JBL studios” in major cities but we will work towards establishing exclusive outlets for Infinity, Mark Levinson and Harman-Kardon. We recently inaugurated our top-of-the-line Harman-Kardon store in the Mall of Dubai and there is no reason we can’t have such a set-up in India, a country where people love their music.